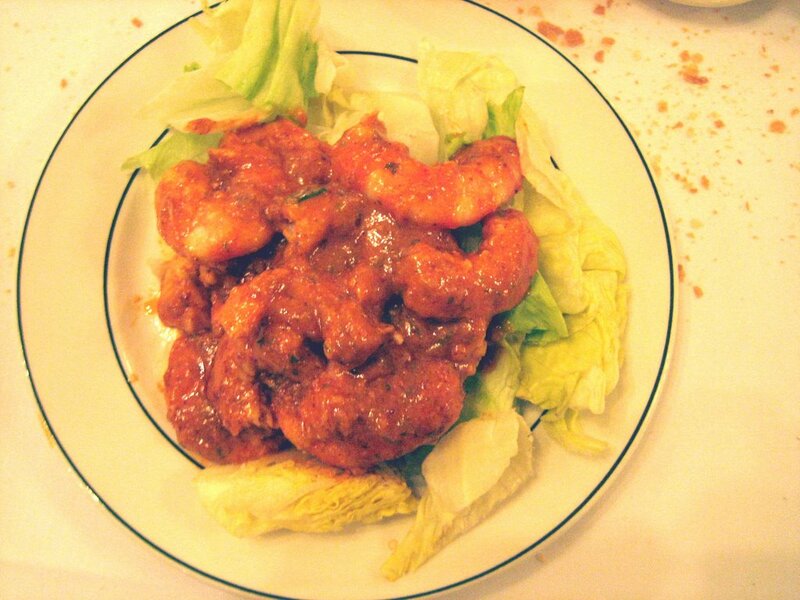 The top photograph of Shrimp Remoulade was taken at Galatoire’s in New Orleans with Mrs. Yi’s Canon Elph camera. The one below was taken with my Canon EOS 20D in a "Studio in a Box" at our Baltimore home. The latter was prepared according to a recipe, clipped from the October, 1989 Food & Wine. It has practically become a family staple. When visiting New Orleans a little over a week ago, we dined at Galatoire’s. From the building to the room to the décor, and ambience, Galatoires' was the same as ever. So was the menu, not to mention the preparation and presentation of everything on it that we tried. Such all-around consistency has everything to do with why Galatoire's is one of America's greatest restaurants. Quite deliberately, I ordered Shrimp Remoulade. As far as Mrs. Yi and I were concerned, it was just like what we'd been enjoying at home for so long. 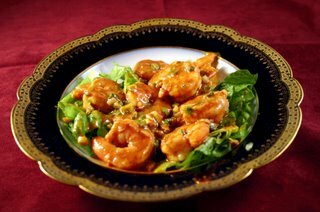 To further evaluate, I prepared our 1989 Food & Wine Galatoire's Shrimp Remoulade recipe shortly upon returning to Baltimore. As best we could ascertain, it was indeed the same. For one thing, the recipe we worked with eschewed tomato ketchup and tomato puree. The recipes on the web used quite a bit of both. Our recipe called for white vinegar; those on the internet stipulated red wine vinegar. All three recipes from the web had a lot more mustard. 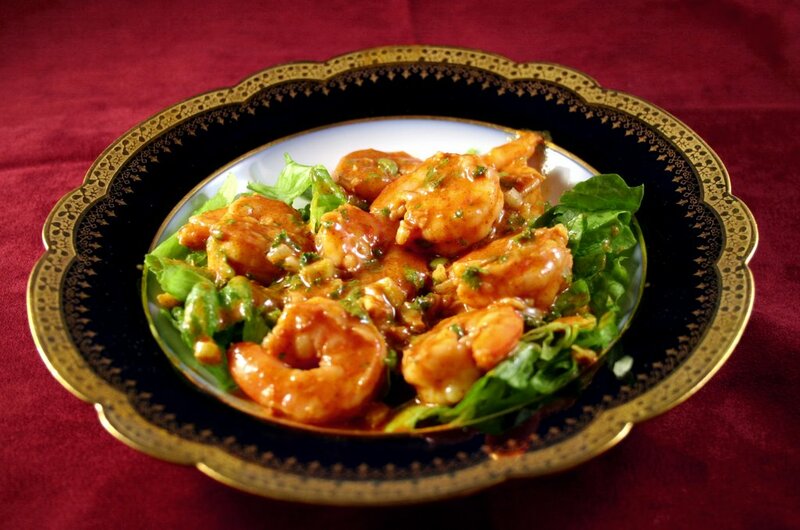 Did Galatoire's change the way it prepared Shrimp Remoulade sometime over the past 17 years? If so, our tastebuds suggested any changes were subtle. Believing that Galatoire's can do no wrong, we don't care. Since you wont find it anywhere else unless you're sitting on a 1989 Food and Wine Magazine, here's the recipe we've made for so long, still make, and continue to credit to Galatoire's. Place the shrimp in a large pot of boiling salted water. When the water returns to a boil or sooner, drain them thoroughly and set aside. In a medium bowl, whisk together the mustard, vinegar, parsley, paprika, garlic, and horseradish. Gradually whisk in the olive oil in a thin stream until thoroughly incorporated. Add the hot pepper sauce and salt to taste. Fold in the celery, scallions, and reserved shrimp until well coated. Cover and refrigerate for at least 3 hours and up to 24 hours. Arrange the lettuce on 6 salad plates and top with the marinated shrimp. Serve cold or at room temperature.